Never had people been so pleasure-seeking as in the spring of 1789, before the meeting of the States-General. For the poor, the winter had been very hard, but there was no concern for the misery of the people. Looking back at our blindness, I can understand it in young people like myself, but find it inexplicable in men of the world, in Ministers and above all, in the King. Many noble families were obliterated, but the requests that we receive from our Dear Readers to help to find a connection to one of them are on the increase. Thus, we write yet again about researching French noble connections and the likelihood of finding any living cousin, even though he or she, once found, would almost certainly refuse to have anything to do with you. Historians estimate, according to the great Gildas Bernard in his Guide de Recherche sur l'Histoire des Familles, that of the noble families in 1789, there remain now somewhere between three thousand and three thousand five hundred. One adds to that the second batch of nobility, that created during the nineteenth century, which included another five hundred or so. Let it be known that the members of each batch sneer at one another; those of the pre-Revolutionary batch consider that their antiquity and royal authority are indications of a genetic superiority, while those of the post-Revolutionary batch consider that titles conferred by Napoleon or later rulers and which were based on merit are indications of a moral superiority that can be inherited. The first step in your hunt is to know to which group your noble ancestor belonged. If of the latter, read no further. Few of our Dear Readers (most of whom are in Britain, Australia or North America) have presented evidence tracing their immigrant ancestor to one of the families among the noblesse immémoriale. The particle "de" in a name is not a sign of nobility. More non-noble French names have the particle than do noble names. Having a coat of arms, a blason, also is not a sign of nobility. Peasants could have them, bourgeois could have them, and not all of the nobility had them. Bernard quotes that, in the seventeenth century, the going rate for a coat of arms was twenty livres, well within the means of a modest budget. Hozier pointed out that plenty of nobles chose not to maintain a coat of arms as they did not wish to pay the tax on it. We would add that we have seen, especially among the dreaded DAR applications, quite a lot of nonsense about noble French ancestors but little documentary evidence and so, the claims in those applications cannot be considered as evidence. Thus, even if your ancestors had the particle "de" in their name and had a coat of arms and were touted as noble in a DAR application, these alone do not mean that they were of the nobility. Even knowing this, many of you Dear Readers, remain undeterred and plan to conduct research in the archives among such things as the Lettres d'anoblissement dating from 1308 to 1499 or the Lettres de noblesse dating from 1364 to 1703 or the dozens of other manuscript sources around the country. We fear that one could become impoverished and disappointed by the effort. We propose an alternative avenue of research, based on a simple assumption: if you are truly a descendant of a French noble, it is unlikely that you are the only one. 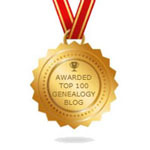 Why not research among known descendants and their lineages for your ancestor? The surviving noble families are referred to as the noblesse française subsistante. The lot of them have been listed in thirty-two volumes Etat de la noblesse française subsistante by Alain Galbrun. These thirty-two large volumes are not online, to our knowledge, but the family names are listed alphabetically on two Wikipedia pages, one for letters A to K and one for letters L to Z . Look there first to see if your noble family still exists. Then, if you can find it and can prove your link to it, why not join the Association d'Entraide de la Noblesse Française, a society established to aid distressed nobles, formed apparently after some nobles at a train station once discovered one of their own working as a porter. Quelle horreur! Surely, there you will find your noble distant cousins, though we doubt that they would condescend to dance with you at their ball.